Don’t think of Threads Of A Prayer volume 2 as a sequel, it is more like a – essential in my opinion – companion to volume 1. Sure, there is less to digest duration-wise; a single disc this time, with three longish tracks and six shorter ones – although Roden groups these together under the title “6 pieces for the unknown” – they’re all reasonably concise in comparison with volume 1. But I’m happy to report that the quality of the material and production is way up there with Roden’s first release on Solaire. As you might expect if you are familiar with volume 1, Roden uses a similar approach in terms of composition; minimal soundings; repetition, modulation and silence. Perhaps due to the comparatively concise nature of the single disc, the results seem more focussed, with melodic information foregrounded. Both volume 1 & volume 2 were recorded at The Reitstadel in Neumarkt in der Oberpfalz, Germany over the 20th to 22nd of May 2016. The Reitstadel building dates from the 16th Century and after suffering damage at the end of WWII, was renovated as a cultural centre and concert hall. From looking at the accompanying photographs in the booklets that come with each album, it appears that for those three days, Roden and his musicians and recording engineer made use of the empty concert hall to make these recordings. The musicians were Szymon Marciniak, Wolfgang Fischer, Sandro Ivo Bartoli and the Bennewitz Quartet, all of whom performed on volume 1. Tobias Fischer on organ is an addition, while the trombonist from volume 1, Johannes Kronfeld, is absent. 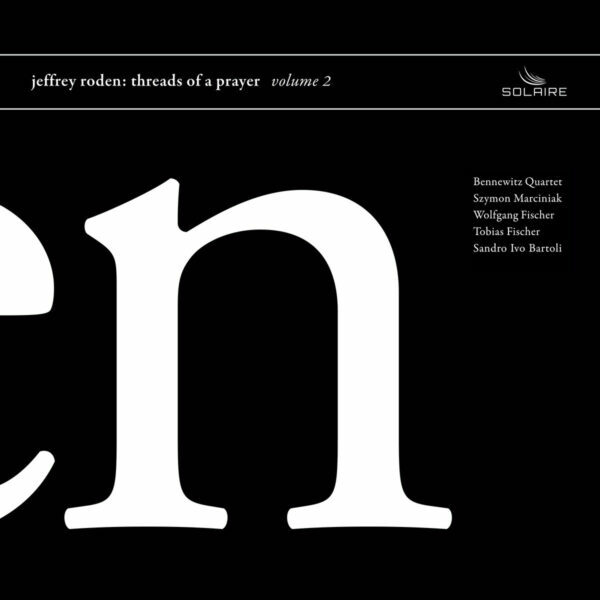 Roden’s previous solo work and its relevance to and evolution of the Threads Of A Prayer recordings is explored in an essay by Tobias Fischer in the accompanying booklet. A certain amount of attention is given to Roden’s previous career as a professional bassist within the music industry, and his decision to leave it behind him – Fischer’s idea, that it “…might make sense to think of the years from 1993 onwards as a single, extended bass solo…” is a superb one – but Fischer delves into Roden’s solo albums: Mary Ann’s Dream (1994), Songs For Susan (1996), The Floor Of The Forest (1999), Seeds Of Happiness Part 1 (2005) and Seeds Of Happiness Part 1 & 2 (2007) in order to create context for the new work. The disc consists of opener “the field” which is a trio for violin, double bass and timpani. I particularly love the second piece, “as we rise up”, for its unrelenting drone and reverential mood. This is a trio for violin, double bass and organ. The title piece for the entire project is the third track. This piece is for solo piano, as is the 25 minute “6 pieces for the unknown”. Considered all together, the work on display here on both albums is stunning; spiritual, transcendent, positive, uplifting. And more than just a list of superlatives. My earlier appraisal of Threads of a Prayer volume 1 is here.